The Option Butterfly Spread is one of the best, if not the very best, option trading strategies. Yet this dynamic trading structure is little used by option traders. Here’s why: it seems complicated to most people. Therein lies a golden opportunity to those few individuals willing to spend a little time understanding how to trade the option butterfly spread. In this article, I’m going to simplify the Option Butterfly Spread for you. It’s true that the setup can seem overly complicated initially. This is because most traders try to master the Butterfly without truly understanding a few basic option trading principles first, all of which you’ll find covered below. The reality is that once you grasp these basic concepts, you’ll see that the Butterfly is just marrying a couple of simple setups that you probably already know. Serious traders take the time to master the skills to increase their returns while lowering their risk. The Butterfly is one powerful way to accomplish this. By taking time to master the Butterfly Option Spread, you’ll gain a powerful edge over others who continue to avoid it. Keep reading, or grab my Option Trading Butterfly Tutorial here. As all traders and investors know, market direction can go through months and even years of higher than usual uncertainty. At times, technical analysis may be painting one picture, while the economic or political environment is painting another. This can be both stressful and costly. Yet, waiting on the sidelines has opportunity costs. Not only this but for many traders who have come to rely on regular income from trading, loss of that income can cause serious lifestyle problems. Then there’s the random earnings news, political winds, or slightly negative economic factor that can wreak complete havoc on an otherwise perfectly excellent option trade setup. These are all factors way beyond our control that we never even considered when structuring a trade setup that has worked many times before. We’ve all experienced this! All of these situations call for a strategy that will work no matter which direction the market or any specific stock heads. This is exactly what the highly versatile Butterfly strategy does. It gives you a trading advantage in any type of market environment. This makes it a powerful strategy that every serious trader will want to add to their arsenal of skills. Now there’s no such thing as a free lunch: The Butterfly spread cannot offer unlimited profit potential since built-in risk management structure eats into returns. But butterfly spreads they usually cost less than buying options outright for protection while providing a powerful positive risk-reward trade setup that simply cannot be found with other trading strategies. Now that you know why you want to know how to trade Butterflies, here are the basics that you’ll get in this article. Unlike other option strategies such as iron condors, credit spreads, or debit spreads that only work with an identified objective based on probable market direction, as noted earlier, the option butterfly spread can be set up and traded for a variety of objectives based on where a trader thinks the security or market is headed. In their simplest form, butterflies can be delta neutral or non-directional trades. This means they can be used successfully when you simply DO NOT KNOW the market direction. Trying to pick the direction of stocks or the overall market can be stressful and expensive. This is when you would use a trading strategy called a Delta neutral butterfly spread, a strategy that takes the guesswork out of trading. This is particularly advantageous because it can allow you to trade successfully when you would otherwise need to wait for clear market direction. If you have to wait for market direction, you could be waiting for months. If you trade for a living, this is not an option. The Directional Butterfly Spread can also be used for bullish or bearish exposure to the market while also managing risk and retaining large potential returns. This directional structure is used when you see a high probability of market direction based on technical analysis or other tools. You Don’t Want to Lose Your Shirt! The Directional Butterfly can also be used as a fast way to hedge on positions that are moving against you. 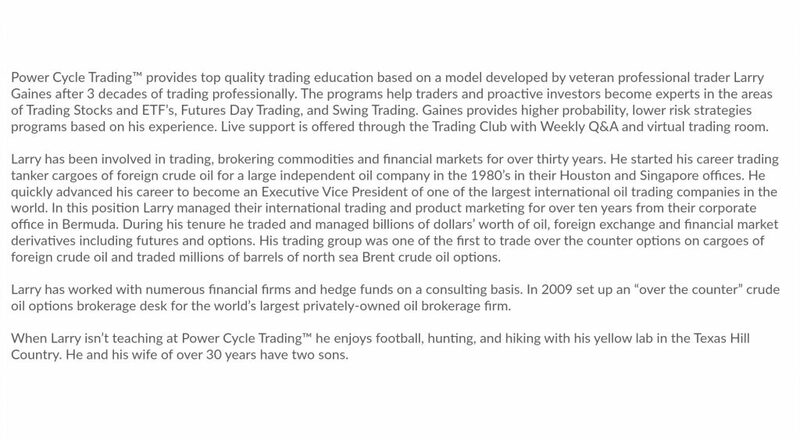 This is exactly what the most sophisticated trading companies do. They hedge, and now so can individual traders! Hedging lowers low when trading, which is something every trader wants. The option butterfly spread provides flexibility with the ability to alter a previous trade. For example, you can construct an option butterfly trade around a strike that is under pressure from another core trade, such as a credit spread or debit spread. We’ve all been in situations where we just need a little more time for a trade to work out perfectly. Adding a Butterfly leg to an existing trade allows you to keep the original position open while buying more time. Often, additional time is all that’s needed for a trade to move back to profit territory. At that point, you can then remove the butterfly hedge and stick with your original trade. Butterflies provide cheap protection! For example, many longer-term investors and swing traders buy puts for portfolio insurance. Long-term out-of-the-money put butterflies, however, can be a much cheaper method of portfolio protection than pure long puts. While no insurance is free, this trade setup is among the cheapest ways to protect your precious capital. Butterflies can be used to generate income from stocks that appear to be going nowhere in the short term but are tying up precious time, capital and energy. This can provide more steady income for those who trade for a living. Not only this, but income also enhances overall portfolio returns in flat markets. A 10-to-1 or higher Reward-to-Risk is common with the Option Butterfly Spread. Where else can this high potential ROI be found? This unusually high-risk-reward ratio makes butterfly trading strategies well worth the effort needed to learn the structure. Butterflies are sometimes called “vacation trades”. You know how you can have a trade open before your vacation that you thought you would be out of before your vacation arrived? Then your vacation time arrives. You know you should close out the trade because you don’t know if you’ll have the time, or even the internet connection, to monitor the trade effectively. But you really, really don’t want to close out the trade because you see the trade can be profitable with a little more time. Butterfly option setups allow you to go on vacation with the trade open and here’s why: their low-risk profile and need for only very infrequent monitoring. A word of caution with this: Just make sure the expiration date is not near or during your vacation. Also, remember these tendencies of butterfly spreads. There’s a lot to understand trading option butterfly strategies. Keep reading or Get my free Option Butterfly eBook here. If you prefer video, click the image below to watch a video I did on trading an option butterfly spread with AAPL. Now that you’ve seen all the reasons that option butterfly spread trading has a very devoted but small following, you’ll first want to understand a few options basics. Every option trader should understand the 3 Greek Tools, Theta, Implied Volatility and Delta. Option Butterfly Strategies heavily take advantage of Time Value, and the impact it has on the price of an option. Without a complete and thorough understanding of how option time decay works, you don’t want to attempt to trade option butterfly spreads. Click here to read my post where I explain about these important but free tools. Click here to see my popular Directional Butterfly Trading Course. Now that you know the importance of Time Decay, let’s move to the structure of an Option Butterfly Spread. This is outlined below. A “bear put” spread entails buying one put and selling a lower strike put, that will be lower in price to offset some of the premium cost and theta decay. 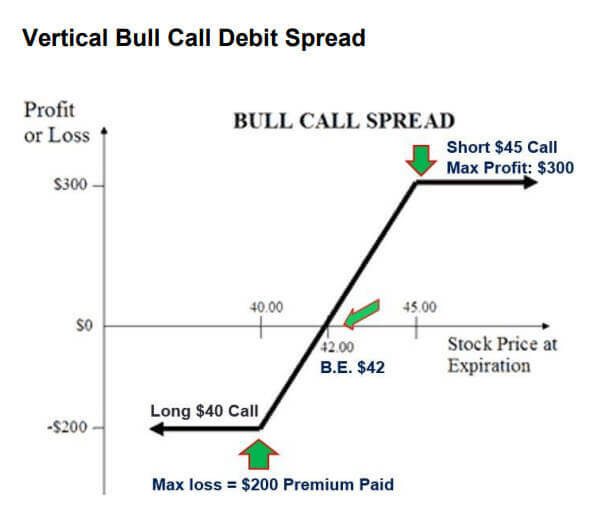 The Bull Call Debit Spread portion or “wing” of the butterfly is shown below. 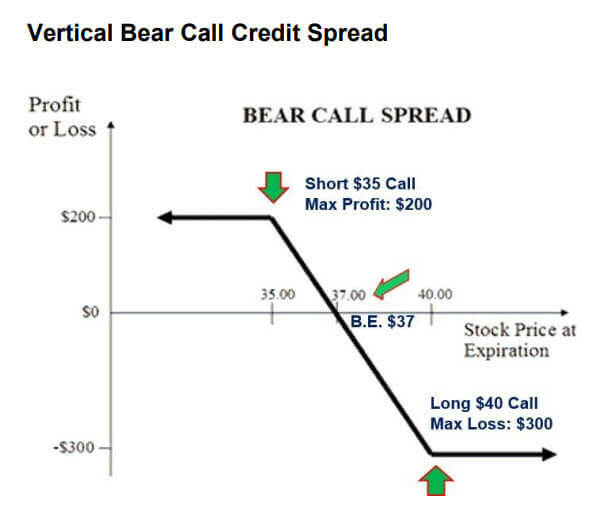 A “bear call” spread entails selling one call and buying a higher-strike call that will be higher in price to hedge the short call. A “bull put” spread entails selling one put and buying a lower strike put that will be lower in price to hedge the short put. You’ll collect an option premium in your account. 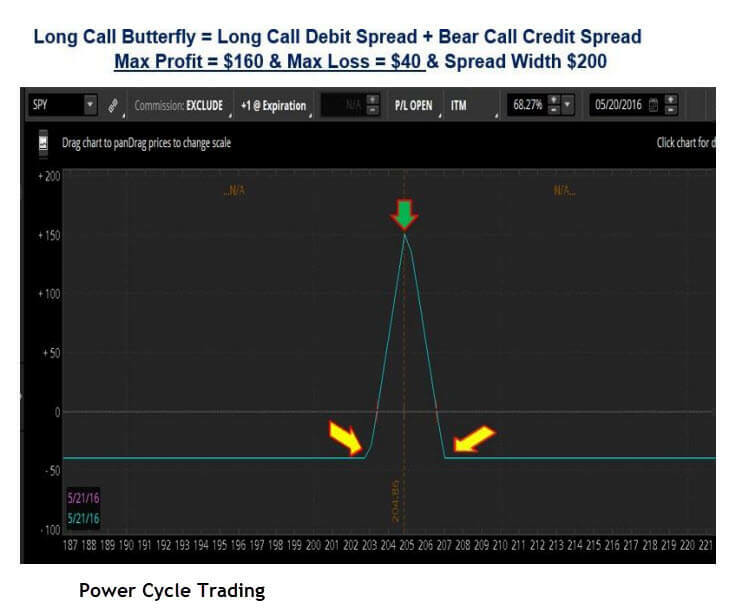 The Bear Call Credit Spread of the butterfly strategy is shown below. Here are the Debit Spread and the Credit Spread trades summarized in the chart below. One major goal of every trader should be to select trades based on what provides the most consistent positive return with low, defined risk. This is not always the trade with the greatest return. Traders must learn to avoid the temptation of the pie in the sky trade, so they can learn to love more consistent, lower risk trades. And one of the best ways to achieve this is by knowing the Option Butterfly Strategies that are available, how they work, and then selecting the one that is best suited for the market environment you are trading. 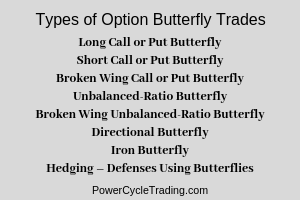 Below are the variations of Option Butterfly Strategies. There is a strategy for every trading environment and situation. As you can see from the many variations of Butterfly Option Strategies, it would be difficult to cover all of these strategies in this one post. What I’ll do instead is provide the exact outline of my favorite Butterfly Option Strategy below. 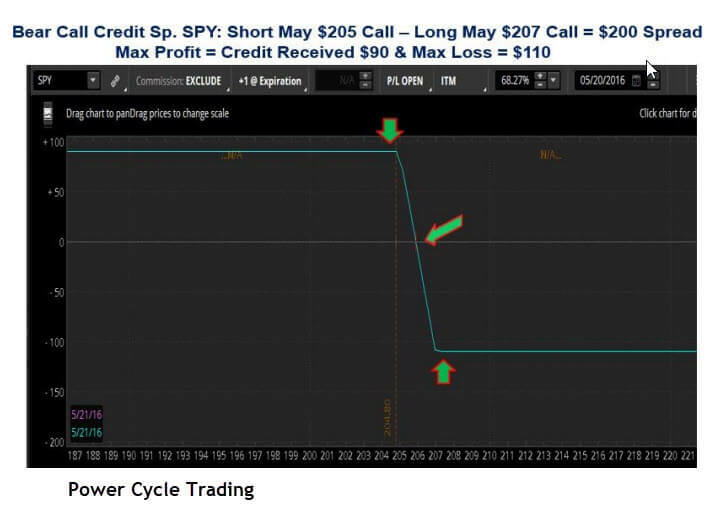 This strategy is a combination of a bull call debit spread and a bear call credit spread. Note that it is a limited profit, and limited risk options strategy, as all Butterfly trades are. This is because they contain an income element and a risk management element. 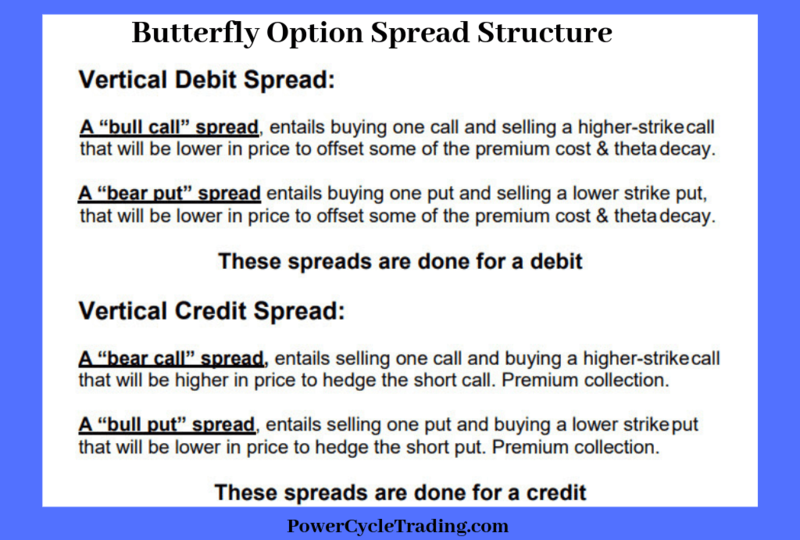 There are 3 striking prices involved in a butterfly spread and it can be constructed using calls or puts. As with all Butterfly trades, this trade is called a butterfly spread because you are short the body and long the wings. This particular strategy can be used as a neutral or directional options trading strategy. This trade results in a small net debit to your account. The maximum risk is the debit paid to construct the trade. Due to the small net debit, this strategy offers an exceptional risk-to-reward ratio. This strategy capitalizes on being short volatility, and time decay. A target price pinning strategy is also utilized here, as is common with Power Cycle Trading™ methods. 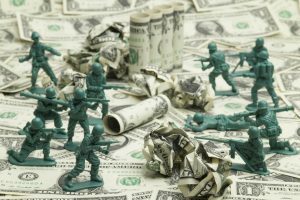 The maximum profit occurs if the underlying security is at the middle short strike or body at the option expiration. In this case, the long call with the lower strike would be in-the-money, and all the other options would expire worthless. The profit would be the difference between the lower and middle strike (the wing and the body) less the premium paid for initiating the position if any. The Maximum loss would occur if the underlying security is outside the wings at expiration. The premium paid to initiate the position would be lost. Remember, a butterfly option spread is made up of two different spreads, both a debit spread and a credit spread. The short strike of these two spreads is at the same price, which is body of the butterfly. At expiration, if any part of the butterfly spread is in the money, that leg should be closed out to avoid being exercised. In summary, Option Butterfly Strategies offer many benefits over other option trading structures. There is one foundation set up for Option Butterfly Strategies which has many variations that can be applied to different market environments and goals. If you want to get that one foundation setup, grab my eBook on Butterfly Option Spreads below.